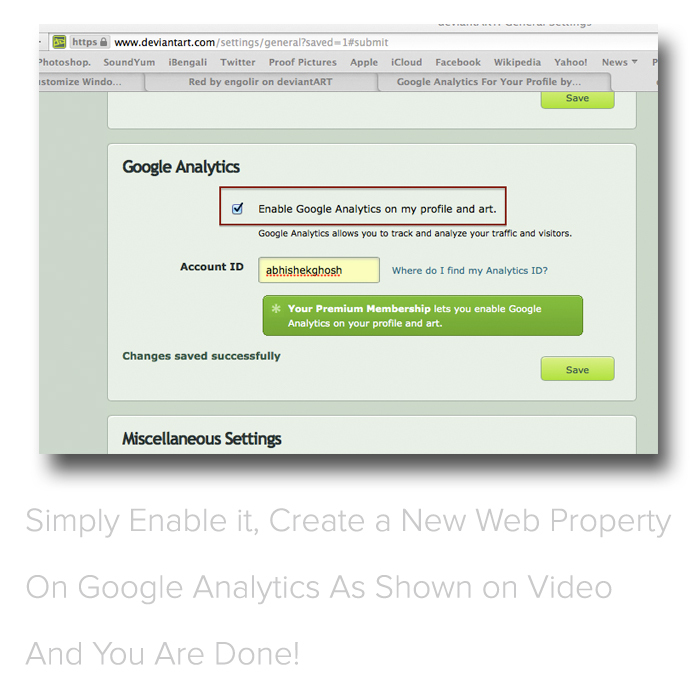 Here is a Step by Step Guide on How To Add Google Analytics For deviantArt Profile. This is a New Feature Added by deviantArt With Latest Google Analytics Code. Not every deviantArt users are quite used with the latest implementation of Google Analytics Script and Google Tags – things has been changed a lot in recent times, so you need not to really work very hard or fight in order to add Google Analytics for deviantArt Profile. If you are using your real name, practically you need not to add the Google Analytics Tracking ID in deviantArt – officially it is written to change, but as subdomain’s name is your name and deviantArt has already Google Analytics script running, it will catch everything automatically. At least, for me, the Account ID (that is the username in UNIX format, abhishekghosh for me) denied to change. Simply checking the box beside the “Enable Google Analytics on my profile and art” option and saving it and then logging out works fine. Google Analytics’ latest code works instantly. You just need to logout and check the webpage’s HTML source code to make sure that the ID is magically got added (it will match with your Google Analytics Tracking ID). Log out and visit your own profile on deviantArt – you will be able to see yourself as a Visitor. This Article Has Been Shared 5359 Times! Cite this article as: Abhishek Ghosh, "How To Add Google Analytics For deviantArt Profile," in The Customize Windows, January 28, 2014, April 23, 2019, https://thecustomizewindows.com/2014/01/how-to-add-google-analytics-for-deviantart-profile/.